The indie game scene has always been a space where psychological horror experiences can thrive. These niche genre titles often focus on telling deeply personal and unsettling stories within the limited confines of their indie budget, often to varied success. These limitations can manifest themselves in unpolished gameplay and environments, frequently resulting in a product less compelling than the developer thought it would be. The inherent nature of horror makes this genre even more difficult, given the balance of meeting player expectations for enjoyment while ensuring its horror aesthetic remains intact throughout. In this regard, The Inner Friend succeeds where a majority of horror indies fail, yet I can’t help feeling like its real potential was squandered to a degree. 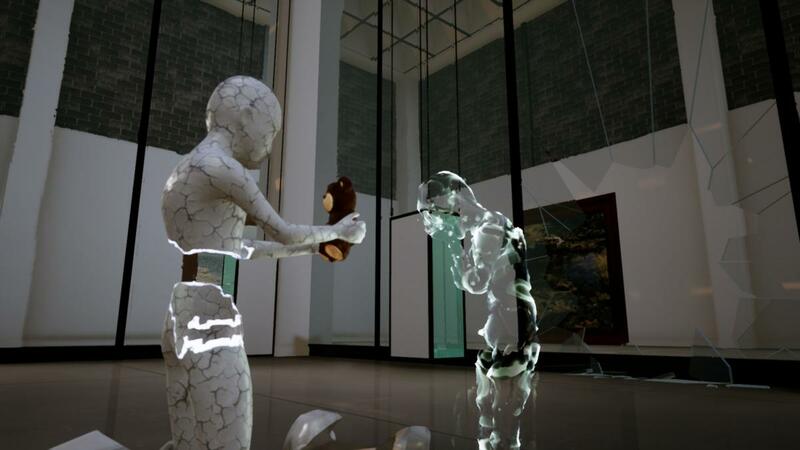 Developed by PLAYMIND, the player controls a child-sized mannequin in this puzzle platformer that explores childhood fears through dreamlike renditions of memories. While each memory deals with a different fear and theme, the game’s unnerving tone and atmosphere persist throughout. Each memory serves as a level, each with a distinct environment that would seem quite mundane, such as a school, hair salon, hospital, etc. It’s the way in which the child’s fear distorts his perception of them that is horrifying. These fears manifest themselves in various ways. A school teacher depicted as a monster covered in fungi roaring menacingly at children. A naked hair stylist wielding scissors and covered in bubbles hunting the child. Or a hospital filled with patients wearing gas masks that are emanating noxious gas that can kill the child. The player has no means of defense from the enemies other than to avoid their patrol routes or to outrun them. The naked and defenseless nature of the player makes these encounters tenser than they usually would be if they were the standard video game super soldier. Clearly drawing inspiration from the likes of The Twilight Zone, PLAYMIND has made even the most mundane of environments unsettling and housing the potential for danger. This attention to crafting a world that defies reality in its construction, and never losing its menace, is The Inner Friend’s greatest achievement. Before a memory is explored, the child has to essentially take a leap of faith soaring downward towards portals that represent his subconscious. It’s a thoughtful mechanic that while I’m sure only serves to hide a loading screen, in the grander scheme of exploring the child’s psyche, it’s cleverly done. After every memory is traversed, the player returns to the child’s bedroom which serves as the game’s hub. Here is where the various discoverable collectibles are housed, each reflecting the memory they were found in. Over time, the room layout and items within it change to reflect the boy’s trajectory from child to teenager. As for its story, those looking for a clear explanation of the plot will be disappointed. The brunt of it requires the player to interpret vague events. Surprisingly, I found this vagueness to make the story more compelling given that a lack of concrete facts makes it more relatable. Despite a lack of dialogue or clear context, there are somber and heartwarming moments dealing with family struggles, adolescents, and irrational fears. It’s a shame that as much as The Inner Friend’s worlds drew me in, the puzzles within these memories were underwhelming. Puzzles such as memorizing light patterns, or maneuvering an environment to avoid a continually moving spotlight lacked a significant challenge that would have justified their inclusion. Granted, had they not been included my experience would have likely been even briefer. The Inner Friend’s nine levels took me only an hour and a half to complete. This was the biggest disappointment of my experience, coupled with an abrupt ending that interrupted my trek throughout this brazenly bizarre world that I wished to continue exploring. There’s the option of returning to levels to finding missed collectibles, though as there is no reward for this, the incentive to replay it is missing. Perhaps more challenging or numerous puzzles would have extended the play, but at its current length and lack of meaningful replayability, $15 is a tad steep. In spite of these shortcomings, The Inner Friend does have rewarding moments that I think make it a worthwhile, if not painfully short, experience. There are genuine heartfelt moments that arise out of exploring these nightmarish memories, each evoking a sense of dread and wonder at the insanity of their construction. It’s unfortunate that I walked away feeling as if its true potential was somewhat squandered on a great concept, as their execution of storytelling and world creation was sound. I just wish there were more of it to experience.